Hi my name is Bryant. I help assist the Doctors at the back office. I make sure all procedures are properly equipped and supplies are in order. I ensure that our equipment is in proper working condition and maintained properly. I graduated in Guatemala as a dentist and I'm studying for the dental board exams for the international program in the US. 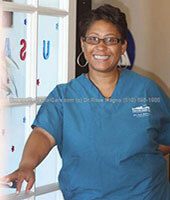 I enjoy working in a professional up to date quality oriented dental office at Emeryville Dental Care. Hello.. My name is Elonda or Londi, also known as Nicole or Nic. I've been working with Dr Magno, along with the rest of our team, for the last 8 years. 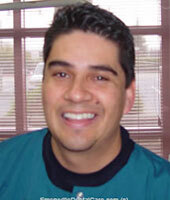 I love my job and hopefully you can come so we can take care of you and your dental needs. I like that Dr Magno is a very caring and conscientious Doctor, who likes helping people. I've learned a lot working here and hopefully you can come here too, so that you can experience our warm fuzzy friendly care. Hi, my name is Jaspreet. I am one of the team members in charge of the back office. I make sure everything is properly set up, disinfected, and sterilized for each patient and I also look after all the equipment. At times, I also assist in the front office. 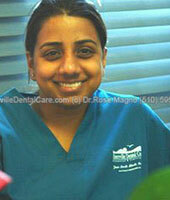 I graduated from India as a dentist and am studying for the National Dental Board Exams. I'm here to learn from the best until I receive my license. I've heard so many good and great things about this office from other peers and patients. I LOVE working with Dr.Magno. Her skills in dentistry and her nature are unparalleled.The smile she brings to her patients is priceless and the way she transforms them from being scared and fearful to shedding off all their fears of dentistry makes me feel proud to be a part of her team. Last but not the least,let me mention this - WE CATER to people who want the BEST for themselves!!! I'm looking forward to taking care of you. Give us a call (510) 595-1900.